Remember that Totally Awesome Dollar Tree floor cleaner I bought back in the spring? Sure you do! I used it again the other day. It is terrible because Howard told me not to. Back when I wrote about it before we were both having fun slip-sliding all over the place but then Howard came to his senses (after crashing into the fridge one too many times) and he told me not to use that stuff again, that it was unsafe. ... in the closet. I knew it could do it. I knew it could take care of all that dirt. The temptation grew too strong to resist. Surely a little puddle of it on the floor, as directed, would not hurt. I could always fib. I could say I picked up the wrong bottle by mistake. I could say something. So like Eve picking the apple from the Tree of Knowledge, I found the Mop & Shine in the back closet and I could not help it, I cleaned the floor with it. Boom, in five minutes, the grimy floor is all clean. That is the way this stuff works. I put it back in the closet and went back to working on Leonard Pennario forgot all about it. Until Howard came home and slid half the length of the kitchen. "Darn it," he yelled. "I told you not to use this stuff again!" I launched into my fib. "Oh, Howard," I said. "I'm sorry. I picked up the wrong bottle and --"
Then I just gave up and started laughing. 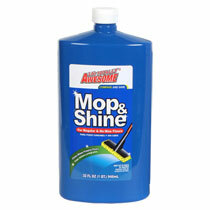 I guess that is it for me and Mop & Shine. Oh well. Mop the floor first, apologize later.